The Twin in Berlin: I'm Just Pushing Forward Now. No Complaining. No Doubting (well sometimes) Just Moving On!!! I'm Just Pushing Forward Now. No Complaining. No Doubting (well sometimes) Just Moving On!!! HERE WE ARE AGAIN. Sorry this keyboard is a little weird so sorry for all of the mistakes I make. Anyway.... Soooo I wish my email would sound as happy and wonderful and gushing with hugs and kisses as Herman Mittleman's was, but that is not the case. DON'T GET ME WRONG I LOVE BEING A MISSIONARY AND THERE IS NOWHERE IN THE WORLD I WOULD RATHER BE THAN HERE RIGHT NOW SERVING THE LORD. But anyway, remember how I said that obedience with exactness would be a blessing or a curse for me...guess which one it is right now.... uhuh uhuh.... tell me more.... if you said curse, you are riiiiight. aahhhhhhh what madness is this. I didn't expect alllll missionaries to be perfect people and have the same opinions and goals as me, but I didn't expect some people to be so.... I don't even know what the word I’m looking for is. Alas, let us move on to better things, the things that have kept me here, and have kept me sane. First of all, massive shout out and thanks to those who have sent me emails and kind words, it's so helpful to think of all the support back home, and I'm so thankful for family and friends that are helping me enjoy this experience. Soooo I’m in the German district, one of two. I’m in the Benjamin Distrikt. I have TWO companions. Both from Germany. There are four other eldres. Alll from Germany. Needless to say the German that rushes through my head as I try to understand is fast, fast, fast and not very clear all the time. Even though we are in England, I feel like I’m in Germany, because I am just surrounded by German ALL THE TIME. In the other district everybody is from Germany, except one girl who grew up speaking German. Grrr she is from Oregon and can understand almost everything. Well she doesn't think so but I do. She is really funny and so nice. It's so weird, I came from speaking no German during the day at all, and hearing none at all except if I played a song or something. And all of a sudden it's all I hear. It's almost hard for me to write this in English, and in my journal too, because I just feel like everything is supposed to be auf Deutsch. hahahahahha it's a wild ride. They all say my German is amazing. Sometimes it is, sometimes it's.....uhh I don't know hahahhaha. So my companions are Sister Frenkel from Frankfurt, and sister Kronwitter. Sister Frenkel talks SO FAST and speaks very litttttle English. 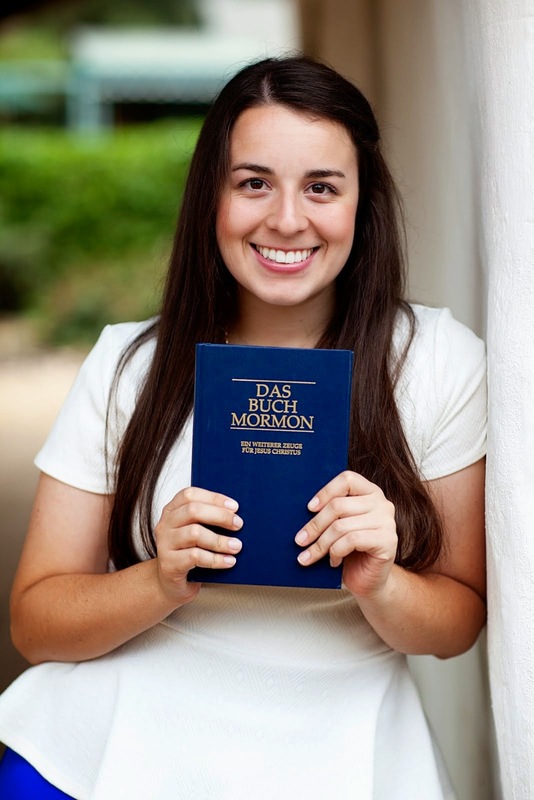 Sister Kronwitter is easier to understand, and knows more English. Haha not like we use it. She is from Bayern! I love them. They're great!! We have good times together. Sister Frenkel was reaaaallly homesick the first and second day. One of the members of the presidency told us our companionship was very inspired, and I think that's true. We've been trying to help each other out and feel the love here. So being here in England is cool I guess, when I remember I’m in England that is. This MTC is so smallllll. It rains a lot, as you can probably guess. There are only about 100 people here. But I love that!! !I I can say hi to President Edwards and sister Edwards on a daily basis. You can walk the whole length of the MTC within 10 minutes. There are three floors. We eat three times a day. I had real shepherds pie yesterday!!! It was so good. We also had burritos yesterday, with salsa and cheese!!! SOMEBODY PLEASE GO GET A BREAKFAST BURRITO WITH QUESO BLANCO FOR ME PLEASE I BEG OF YOU!!!! awwww man I miss the food my momma makes. It's all good though. I’m here on the Lord's errand. Everyday I try hard to remember what I'm here to do, and who I represent. Before I came to the MTC, I understood that missions were hard, but I didn't really understand what that meant!!! Now that I am here, I have already learned my lesson. It's hard. Teaching is hard. Getting along with people is hard. I'm really trying to love my district, even when they are not obedient. When the MTC Presidents wife personally tells you to only play church songs on the keyboard, you only play church songs!!! Don't take pictures in the district rooms means DON'T TAKE PICTURES IN THE DISTRICT ROOMS. I don't feel the personal responsibility to tell these elders what the rules are, I think we are all old enough to make our own choices, and especially as missionaries, to choose the right and do what Christ would to. Ok that's all I'll say about that. I hope I don't sound wilted or overwhelmed. I’ve really gotten over the fact that this is a hard thing. I’m just pushing forward now. No complaining. No doubting (well sometimes) just moving on!!! We got together to practice praying with people that we teach, and I was paired with our distriktleiter, elder Apel (who makes fun of my American voice, he sounds a little like Arnold hahahahha) and before we started, he said to me in English, "please don't hurt me" hahahahhaa not really sure what that meant but ok.
\\mom thank you for that little bag of notes, and the little pink book!! My companions think you are SO PRETTY!! And the best mom. hahaha i look at it everyday. I can't say how much I love being here. Everyday I pray to my father in heaven and thank Him that I am a missionary. The thought of it brings tears to my eyes, I am always overcome with the spirit. WHAT A WONDERFUL WORK THIS IS. Well, we leave on Wednesday morning for Germany. YESSSSSS. Of course the Geman will continue to be a struggle, but I gladly welcome the challenges, because I have the Lord on my side. das stimmt!! Yesterday I was writing in my journal, and I wrote sigh. ( you know to indicate that you're sighing in writing) haha. And as I put my scriptures up on the dresser, I felt like I should open my bible to the page that the bookmark was on, just to read what was there. Mind you, this mark is the little piece of fabric already there when it was wrapped up stuff. I read the verse that first came into sight, and sure enough it was Isaiah 35:10. GO READ IT!!! Needless to say, I know that God loves me. I know that he has a plan for all of us. The gospel of Jesus Christ is meant for everybody on the earth that ever lived. Following Christ's teachings and example helps us to be happy, and to return to our father in heaven. They want us to, and expect us to return someday!!! I know that will all of my heart!! !